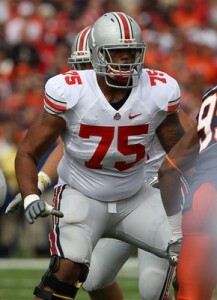 A tall, long armed, athletically built offensive tackle. Displays good initial quickness off the snap in the pass game. Demonstrates the ability to keep his base down on his initial power step off the line from a two-point stance, but will bend at the waist and get upright when asked to play from a three point stance. Nevertheless, the guy can bend. Shows natural fluidity in the hips and good short area quickness toward the edge and when asked to mirror. Struggles with balance and footwork at times, gets overextended when trying to shuffle and slide on a counter. Needs to continue to clean up his lower half technique and do a better job staying more compact and balanced when changing directions. However, looks much more balanced as a senior and seems more patient in space and trusts his technique much more in 2011. Is long armed and keeps his hands up in order to protect his frame, and again has improved his punch as a senior, looking more coordinated and patient into contact as he keeps his chest plate clean. Is an athletic kid who has a burst off the football and when he keeps his pad level own he can create a jolt. At times will get upright which negates his leverage, but does have some in-line power. Is at his best crashing down the line inside and delivering a nasty punch in order to seal the edge. Also, possesses the short area quickness/coordination to reach blocks on the edge and is comfortable in space. Gets a bit overextended trying to breakdown, but for the most part will hit his man. Will miss the first five games of the season for being part of the Ohio State scandal where he was said to have sold memorabilia for benefits. Impression: He’s a talented kid with a big frame, long arms and natural movement skills. He can bend and if he can put it all together and continue to improve his footwork he could certainly mature into a starting caliber left tackle in the NFL. Very tall prospect who has ideal arm length for the LT position…does a good job getting set up quickly off the ball…flexible OT who can bend well and does a good job staying on balance…Good quickness and burst out of his stance when asked to seal the edge or get out in front of a screen or toss play…Delivers an effective punch that he uses to keep more aggressive pass rushers away…does a good job protecting his body and not giving defenders spots to bull rush him…is at his best when asked to initiate contact in the running game…locks on and drives his man off the line consistently. Doesn’t have the necessary strength to handle the bull rush at the NFL level…seems to struggle more with quick twitch DE’s who can go inside and outside…will get caught guessing at times about what his opponent is going to do and will find himself over compensating and getting beat…does not finish as many blocks as we would like to see…still has footwork issues that at times have him looking uncoordinated as he tries to slide…speed rushers can catch him lunging at them and get around him when he does that. Mike Adams has been suspended for seven games in his collegiate career. That fact may ultimately hurt his draft stock with some teams, but his pro potential is very good despite being a raw prospect. Given his elite height and size, Adams certainly passes the eyeball test as a pro prospect. He is the prototypical left tackle prospect who really excels with his footwork and has the talent to improve his technique. Adams will need to grow as a run blocker. He lacks that killer instinct offensive line coaches fall in love with. He will need to correct his techniques as a zone blocker as he sometimes loses his assignment and gets lost out in open space. The most promising facets to Adams’ skill-set are his frame and good feet. He may need an extra year to develop or grow into the position as a rookie, but most every team in the NFL is willing to be patient with a guy his size. Adams will climb up draft boards as teams review his 2011 game film and see that he has grown since his junior year. Mike Adams is a huge offensive tackle prospect who is dripping with upside. 6-8. Bends his knees naturally. Good footwork. Athletic. Still a bit raw, and I’m not sure if he’s ready on Day 1 to start. Being looked at as a left tackle prospect, but I think he has the size to dominate at right. He has the movement skills of a left tackle, but he can certainly translate that to the right. He had the suspension, so there’s issues there. But, as far as projecting him, he has all the requisite skill sets to star at either tackle. With a good position coach to help him with technique, he could be a star. He’s a first round pick, and I’m not sure if he’ll be there at 32. But, I think the Giants need to replace Kareem McKenzie. I think Adams can do that. Can he start right away? I don’t know. But, I think it would be quite nice to improve a subpar offensive line, and to do so with an elite prospect, something they haven’t done in some time.